Hi! Thanks for visiting our page. I am Danica Connell, the owner. You will be working and talking exclusively with me. My husband, Dan, has a role in this too, as you will soon read. 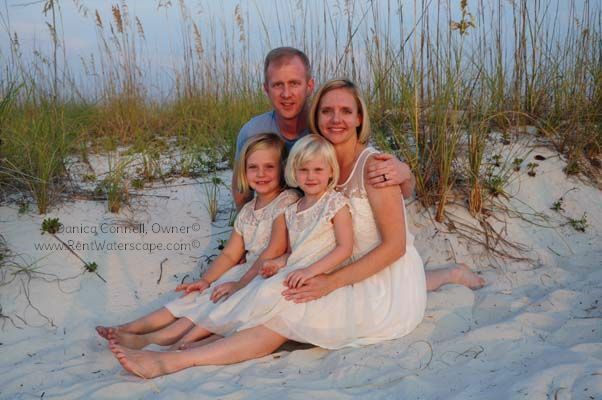 We are a family of four from Alabaster, Alabama which is about 30 minutes south of Birmingham. We live 4 hours from the beach, but with the kids, count on a little more. We rented at Waterscape for 3 years before buying. We bought our first Waterscape unit (C203) in 2012, just after the real estate collapse. We did well, so we bought our second (C505) in 2014. I got a wild hair and in 2016 I decided to purchase our third unit, B112. In 2019, apparently I had gone nuts, because we laid down a contract for A312. We put our renters first and only visit our condos for "last minute" trips, taking advantage of openings that don't book. When we visit the beach, we are working just about non-stop. We keep our units TOP NOTCH and strive to have the best units in Waterscape. Every time we visit we are painting over scuff marks, tightening screws, oiling parts, and cleaning crevices. My husband, Dan, bless his heart, it's his elbow grease that really keeps our units' maintenance beyond what even I expect. We currently have the best rated units in the complex. It's not as easy as everyone thinks. But I love it! I enjoy talking with people about Waterscape and the area, so if you have any questions, feel free to Contact Me. If my dates are booked during the period you want to visit, let me know and I will put you in contact with some other owners.